From a left-wing community once at the forefront of struggles against racism, unconditional support for Israel has turned a significant proportion of Toronto Jews into promoters of hatred against “Arabs” and into allies of right wing, bigoted, homophobic Christian Bible literalists. During 15 years of activism in Montréal, Ottawa and Vancouver I haven’t seen anything equivalent to the racist, militarist pro-Israel movement experienced recently in Toronto. And sadly the quasi-fascistic organization driving the charge seems increasingly enmeshed within a community that once led the fight against racism and fascism in the city. On Saturday at Queen’s Park (the grounds of the Ontario legislature) I was shoved, spat on, had my bike damaged and lock stolen by members of the Jewish Defense League (JDL), a hate group that is banned in the U.S. and Israel. My offence was to chant “kill more Palestinian children” as hundreds of JDL and B’nai B’rith supporters rallied to applaud the onslaught on Gaza in a counter demonstration to those opposed to Israel’s massacres. The following day, also at Queen’s Park, a JDL member knocked a pro-Palestinian counter demonstrator to the ground and kicked him in the face. Half an hour after this happened, a JDL member walked some 50 metres around a barricade to where I was standing alone chanting at the pro-war rally and spat on me three times. Both incidents were caught on tape by major media outlets. New to pro-Palestinian activism in Toronto, I was unaware of just how aggressive and organized the JDL had become. It’s reached the point where some Palestinian solidarity groups avoid publicizing pickets out of fear they might disrupt them. In the US the JDL has been outlawed since 2001. Its members have been convicted in a series of acts of terror, including the killing of the regional director of the American Arab Anti-discrimination Committee and a plot to assassinate a Congressman. A member of the JDL’s sister organization in Israel killed 29 Palestinian Muslim worshipers in the Cave of the Patriarchs Massacre twenty years ago. In 2011 the RCMP launched an investigation against a number of JDL members who were thought to be plotting to bomb Palestine House in Mississauga. Despite the group’s links to terrorism, the JDL appears to find support from much of the organized Jewish community and even in Ottawa. In a significant boost to the group, Stephen Harper included a member in his official delegation on a recent trip to Israel; recent Canadian Jewish News coverage of the group has been sympathetic; rabbis attended the JDL/B’nai B’rith sponsored counterdemonstration Saturday; on Sunday the group provided “security” for the Canadians for Israel rally. Rather than being an isolated fringe group the Jewish mainstream tries to ostracize, the JDL seems to be gaining influence. The growth of Canada’s JDL parallels the increasingly extreme violence of the Israeli government and the resulting worldwide outrage over that country’s aggressive expansionism. 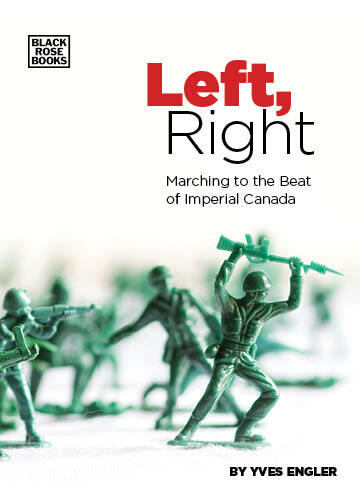 The mainstream Jewish community is marching in lockstep with the Israeli state and Stephen Harper’s Conservatives have not only accepted it, they have promoted it. Over the past three weeks Israel has killed over 1,300 Palestinians in Gaza, displaced more than a tenth of the population and destroyed most of the area’s electricity and water supply. Yet, the Israeli government still receives unequivocal support from the Centre for Israel and Jewish Affairs, B’nai B’rith and other leading Canadian Jewish organizations. As part of its support for the recent killings in Gaza the United Jewish Appeal Federation of Greater Toronto, the community’s main philanthropic arm, has added $2.25 million to its annual aid to Israel. While the JDL would likely back the complete incineration of Gaza, one wonders just how far the more mainstream groups are willing to go in cheering on Israel’s current onslaught, its third large-scale assault on Gaza in five years. Will the Jewish establishment withdraw support if 2,000 Palestinian are killed? Or is the breakpoint 5,000? Or maybe B’nai B’rith and the Centre for Israel and Jewish Affairs would back the Israeli military all the way to 50,000 dead? While one might want to believe that the warmongering promoted by dominant Jewish organizations is not widely shared by the community they claim to represent, I’ve seen too many sizable pro-war rallies and witnessed too many outbursts of anti-Arab racism over the past three weeks in Toronto to be hopeful in this regard. Wide swaths of Toronto’s Jewish community seem to be mimicking the Israeli public’s racist militarism. (Google stories about Israelis chanting “death to the Arabs”, celebrating military blasts on Gaza from hilltops nearby or beating peace activists.) On Bloor Street two weeks ago a middle-aged man walking with his partner crumbled a leaflet I handed him, pointed at two older Arab looking men who responded, and yelled “barbarians”. In a similarly bizarre racist outburst, a man who was biking past the Saturday demonstration stopped to engage and soon after he was pointing at a young Arab looking child close by and telling me that I was indoctrinating him to kill. And then on Sunday an older woman interrupted a phone conversation I was having about Israel’s destruction of Gaza and yelled she hoped Israel kills “10,000 more”. The idea that Toronto’s Jewish community in 2014 would be front-and-centre in backing racist militarism is profoundly depressing and quite the historic reversal. Seven decades ago righteous Jewish youth fought back against fascist thugs terrorizing non-Anglo-Saxons in the 1933 Christie Pits Riot. Two decades after that the Canadian Jewish Congress helped win the famous Noble v. Alley Supreme Court case, which prompted Ontario to pass a law voiding racist land covenants, a major victory in the battle for racial equality. But, while six decades ago Jewish organizations fought racist land restrictions, today there is no other community that so strongly and openly backs racist supremacy in land use. Six months ago some 4,500 people packed the Toronto Convention Centre to honour Stephen Harper at a Jewish National Fund fundraiser. Owner of 13% of Israel’s land, the Jewish National Fund excludes Palestinian citizens of Israel and other non-Jews from its properties. In 2014 “respectable” members of the pro-Zionist Jewish community fundraise for an organization with racist land covenants, work together with Christian fundamentalists and defend Israel’s slaughter of civilians in Gaza, while the harder edge youth attend JDL demonstrations or enlist as “lone soldiers” with a murderous foreign army.